In her one woman hit show,which is based on the life of Nina Simone, Apphia Campbell tells the story of Mena Bordeaux. As a child Mena was a classical piano prodigy, her hopes to establish herself as one of the first African American classical pianists were destroyed when she was rejected from the esteemed Curtis Institute of Music, she was unable to full fill her potential in this area but forged a career as a world class jazz musician. The scene is set in a bedroom, which Mena has shut herself away in for three days, to perform a spiritual and physical cleansing after the death of her father, whom she had not spoken to in over a year. There is a battered brown leather suitcase full of treasured memories, her dads jacket and shoes, old love letters and the rejection letter from Curtis. She clutches a photo of her daddy and speaks to him, recounting memories from her life, the conflict with her religious mother who believed Jazz was the devils music, loves lost, unhappy relationships, dealing with racism and her involvement with the civil rights movement. 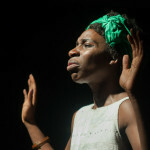 Apphia Campbell gives a spellbinding performance throughout with flawless transitions between characters, which she plays with great emotion and poise. The use of sound bites from the civil rights movement, speeches by Martin Luther King and J F Kennedy, and a heart stopping moment when it is announced Martin Luther King has been killed added poignancy to the story, especially with the current racial tension in the US at the moment.The story is intelligently interspersed with Nina Simone’s songs, which are sung so beautifully by Apphia, her voice has an amazing raw quality, every time she started singing I got chills down my spine. The final scene where Mena connects with here father and receives his forgiveness, followed by Apphia belting out “Feeling Good” was stunning! Going by the standing ovation by the audience at the end, everyone enjoyed it as much as I did. Posted on May 26, 2015, in Uncategorized. Bookmark the permalink. Leave a comment.